Michael W. Bard was a popular Canadian Furry author – more accurately a 'transformation' author – who wrote many online stories during the 2000s, and was a co-editor or close supporter of online magazines TSAT and Anthro. He unexpectedly died of an aneurism in March 2010 when he was only 44. His friends in the fandom have edited and published this collection of his fiction as a tribute to him. The majority of these thirty stories are about the protagonists (usually but not always humans) turning into Furry creatures, and how this transformation affects them. Horses (regular, centaurs, unicorns, pegasi), deer, squirrels, avians. A coelacanth. A giant snail. There are a very few 'straight' Furry tales here, and an equal few that are not Furry but about traditional Celtic shapeshifters. A couple are humorous, but Bard preferred the bittersweet ending, the emotion-tuggers. These are all well-written, and Bard’s friends have done both him and us a service by collecting them into this memorial collection; but you’d better have a handkerchief handy while reading. There are four Forewords by the publisher and editors (Will A. Sanborn, Phil Geusz, Jason Gillespie, and Jessie Tracer/Electric Keet) and thirty stories. Most of the stories are standalones, but there are eight in two shared-world universes; Xanadu and Metamor Keep. These are not all of Bard’s fiction, but they include the majority of his short stories. The stories are different enough that there are tales here for all tastes — from novellas to short-shorts, from male to female protagonists, from voluntary to unwilling transformations, from “hard” science fiction to pure fantasy to traditional ghost stories (including the dead lover who returns in animal form). Among my favorites are “Becoming a Patrolsentient”, Bard’s tribute to Robert Heinlein’s Red Planet and Space Cadet, with an anthropomorphic Space Patrol; “Stress Testing the Terminal Velocity of a Bunnytaur”, a hard s-f tale featuring adolescents bioengineered into characters from Walt Disney’s Bambi aboard a spaceship; “Deaf and Blind”, a cynical reversal of the predator-prey stereotypes; “The Reality”, where an anthropomorphized animal-man tells a convention of Fursuiters what it’s really like to live as your Fursona 24 hours a day, forever; and – well, they are all good. You will probably have different favorites; and some are comedic, but do keep that hanky nearby when you read these. Some books are made to be read all at once, while others are made to be read a bit at a time. 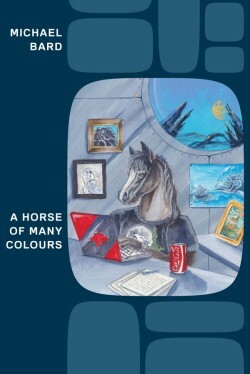 A Horse of Many Colours is one of the latter. These are stories to be savored, to be thought-about. You may not enjoy all of them in the usual way, but you will remember them. There are four Forewords, by Will A. Sanborn, Phil Geusz, Jason Gillespie, and Jessie Tracer/Electric Keet. I don't know why the two middle editors have been dropped from my review. A missing " within the link for Phil caused his name and Jason's to be viewed as part of the link address, removing them from visibility - my apologies! Fixed now. I think I'll have to check that out.